Ancient Ayurvedic Yoga Oil Now Available in the USA, Canada and Australia Exclusively! • Soften and smooth dry skin and flaunt a toned-looking body with lustrous skin from head to toe! • Strengthen and calm your mind, get set to welcome the day with a soothing, meditative, re-energizing experience, every single day! Be among the first to get this unique Fitness-Facilitating oil now - and get a special 11% off! First and foremost, what IS a 'Yoga Oil'? And NO - we're not talking about the essential oils people burn in Yoga studios for aromatherapy or just to provide a fragrant ambience. We're talking about a REAL Yoga Oil that does for your skin what Yoga does for you, that does to your body what a workout, a massage at a spa and a meditative session do together!! 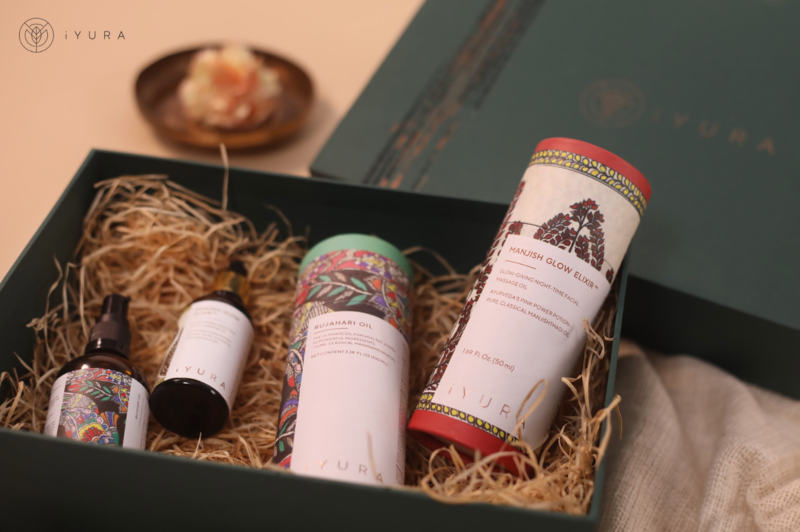 Today, in 2018, iYURA brings to you the powers of 15 Ayurvedic ingredients that have been methodically prepared to give you a luxurious warm-up every day. You too can benefit from the secret of the ancient Yogis and warriors and transcend your practice into a more immersive and integrative practice. Mature people who understand the benefits of body massage and wish to make an intelligent choice with the kind of oil they opt for. There are no shortcuts to health, every single day, every single habit compoundingly contributes to what you will be tomorrow- Why not make those steps, indulgent, luxurious, lovable and enjoyable? This is not your ordinary, floral-smelling body oil… This is a Mega-Yoga-Oil, it has survived for over 800 years, contains 15 ingredients, and is developed using a complex cooking procedure! If you're someone who's very active, you will LOVE this. BUT, if you're someone with a more or less sedentary lifestyle, you will NEED this! Even if you're not very active, promoting circulation by massage helps shift the way you converse with your body. It provides you with an opportunity to provide reassuring touch to your body and boost your confidence. Interestingly, the ancient Ayurvedic texts, too, talk about the power of daily body massage when it comes to fitness. But Vyam Yoga Oil™ transcends massage with the benefits of the herbs shared with the body transdermally. 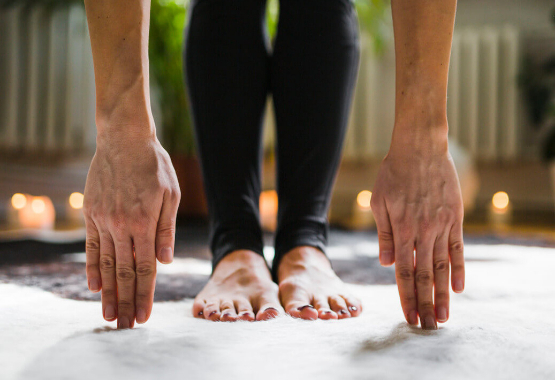 Vyam Yoga Oil™ is specifically meant to boost flexibility and an active lifestyle and 11+ specifically selected herbs work exceptionally for this. But you never thought of oiling yourself before any kind of yoga or exercise, did you? Right here is that something important that you’re skipping! The recommended daily routine found in ancient Ayurvedic texts suggests a series of daily practices to maintain optimum functioning of the body, and oiling is an important part of it. This recommended order of healthy activities ensures your system is well cleansed inside-out and provides regularity and energetic balance. In the recommended order for body care, Body Massage comes after 4-5 other activities - and exercise comes even after that! Both physically and energetically, it is important to prepare the body for the intense physical activity it is about to perform. Or, to encourage it to be active for those who can't workout. When you use an appropriate oil to massage your body for just 5-10 minutes every day - completing the ritual by placing a hot towel on your body and then wiping the oil off - not only do you prepare and tone the body, you ground your mind and you also get the bonus benefits of soft, radiant, healthy skin! 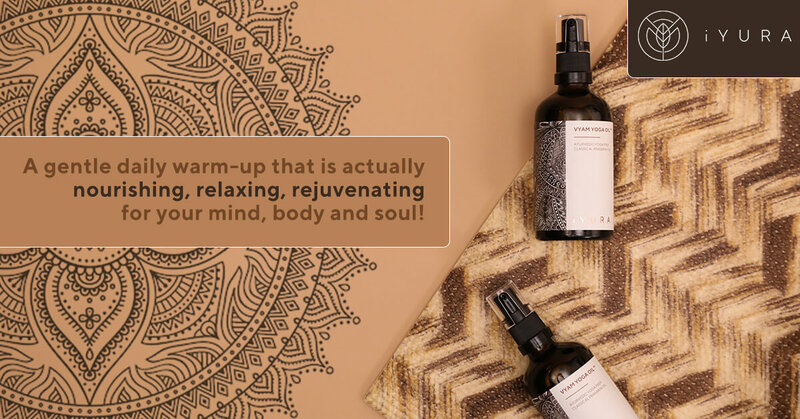 There is yet another critical reason to massage your body every day, which we'll tell you after we’ve revealed more about this Ancient Ayurvedic Yoga Oil, now available for the first time in USA, Australia and Canada, which is meant specifically for this purpose. The perfect pre-yoga and everyday warming massage oil is Vyam Yoga Oil™ with 15 Ayurvedic ingredients, some of which will surprise you! Vyam Yoga Oil™ gets its name from ‘Vya-yam’ - the Sanskrit word for exercise. It’s a perfect pre-yoga oil but also works excellently as a body oil for someone who does yoga regularly or has/desires a physically active life. This incredibly balancing oil is warming and stimulating. Not only does it gently shake off laziness, it also firmly soothes the agitation your muscle groups experience after physical activity. Massage generally boosts blood circulation, but when done using this oil, it generates a calming warmth that feels relaxing. For those who know more about the science of Ayurveda, this oil is very Vata-Kapha balancing. 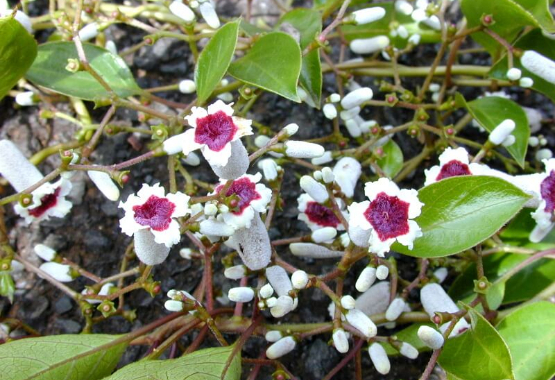 Due to its unctuous and Vata pacifying qualities, it supports a firm appearance of the limbs and helps you to move freely. The oil, due to its 'sara' or 'easily spreading' nature, goes deep into the deep tissues (or Dhatus) nourishing the bones, tendons, and ligaments, strengthening the whole body and calming it down at the same time. 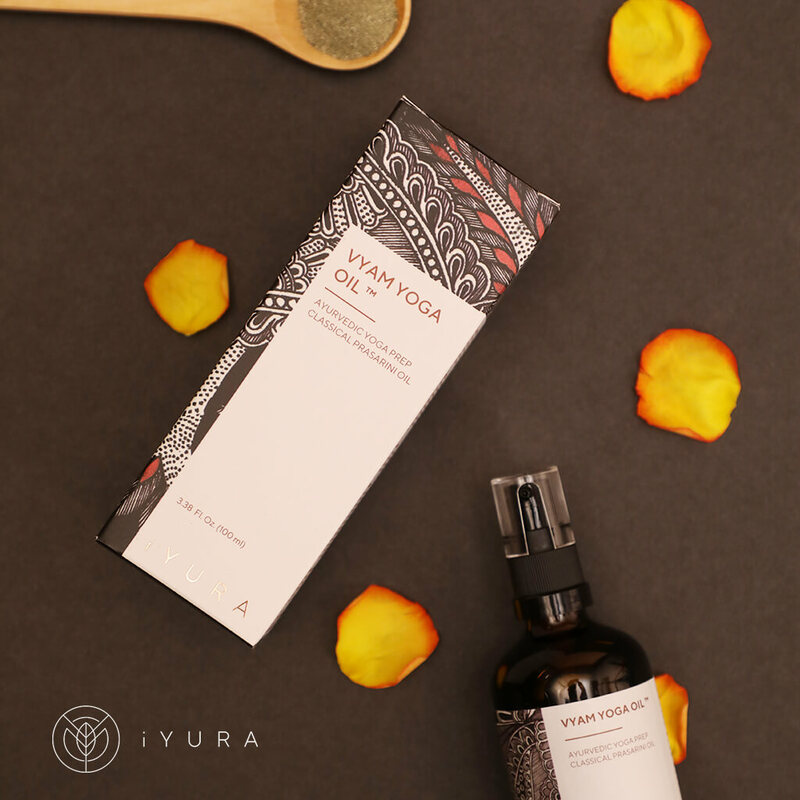 iYURA’s Vyam Yoga Oil™ is the perfect warming oil to prep and ground your body for focused ‘Vyayam’ or exercise, or even to get you set for the day! Not only that, its meditative, balancing blend of essential oils with Lavender, Citriodora and Rosemary immediately puts you into a calm but alert and active state of mind. Take your fitness routine to the next level with this Multitasker of an oil and get a special 11% off! Meant to be used before your daily Yoga practice, this oil warms your body up, uplifts subtle energies and gives you the strength you need for the perfect practice! This unique formulation contains powerful Ayurvedic herbs like Himalayan Cedar, Prasarini, Long Pepper, Indian Camphorweed and many more unique ingredients rarely found in oil formulations like Himalayan salt, yogurt and fermented rice gruel which also help to boost the skin tone! This is a sour liquid produced from acetous fermentation of powdered rice. 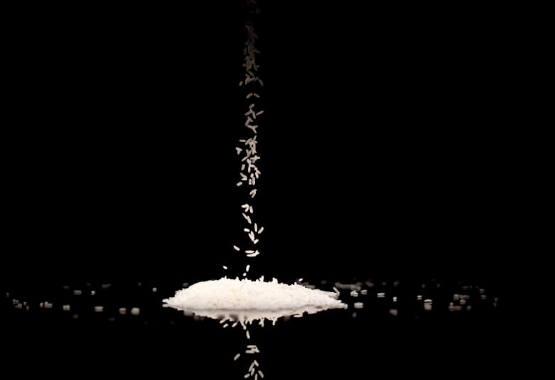 Remember the Korean beauty trend of using rice water? Well, it seems like the Koreans were not the only ones who knew it, a little further south in Asia, Indian physicians were taking it one step further - using fermented rice gruel! Not only did that make the oil lighter, it also gave it the ability to impart a lustrous glowing complexion. The formulation of iYURA’s Vyam Yoga Oil™ is inspired by that which was first mentioned in a text called ‘Sa-ranga-dhara Samhita’ [Madhyama Khanda], that can be dated back to the 13th century A.D. The key herb in this formulation is called ‘Prasarini’ in Sanskrit. Prasarini means that which spreads. As a creeper plant, this herb spreads structurally and also functionally due to its ‘Saara’ (spreading) property, it also spreads healing benefits all over the body. Another interesting ingredient of this formulation is Himalayan Rock Salt, called ‘Saindhav’ in Sanskrit. Himalayan salt is formed as a result of ancient seas being covered by lava. 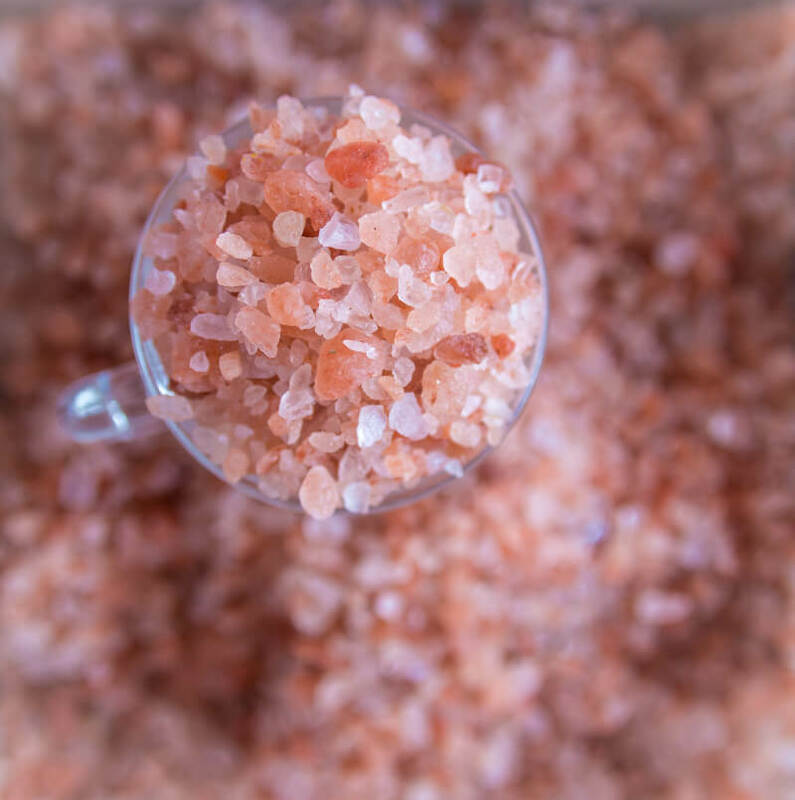 Unlike other salts, Himalayan Rock Salt is believed to be a Pitta pacifier. It is used in this oil for its moisturizing effect and Kapha liquefying properties that enhance the lightness inducing property of its base oil, which is Ayurveda’s good old sesame oil. Cow milk, Skunk Vine (Paederia Foetida), Sesame Seed Oil (Sesamum Indicum), Yogurt, Fermented Rice Gruel, Licorice (Glycyrrhiza Glabra), Long Pepper (Piper Longum), Leadwort (Plumbago Zeylanica), Himalayan Rock Salt, Sweet Flag (Acorus Calamus), Himalayan Cedar (Cedrus Deodara), Indian Camphorweed (Pluchea Lanceolata), Java Long Pepper (Scindapsus Officinalis), Indian Dill Seed (Anethum Sowa), Nardus Root (Nardostachys Jatamansi). Using Vyam Yoga Oil™ is super-easy and extremely convenient. All you have to do is just rub it on your body, with gentle strokes, caressing the joints and muscles. And that's it. You're done. Just a quick 10-minute enriching massage before you proceed with your fitness routine. Warm the oil. Avoid using the microwave - you can make a hot water bath around the oil. Apply the oil first on the crown of your head or at Adhipati Marma, where vital energy is concentrated. You can find this point by placing the tip of your thumb at the tip of your nose and stretching your fingers upwards. The spot where the tip of the middle finger touches the scalp is the Adipati Marma. Apply on your earlobes and give your ears a gentle massage. Next massage the bottom of your feet. Once that is done, apply the oil on your limbs with long strokes, and on your joints with circular strokes. Next, massage the abdomen & chest in circular strokes as well. Once the massage is complete, take a towel soaked in hot water and wipe the body with it. Be sure to wipe your hands and feet with a dry towel prior to exercise! 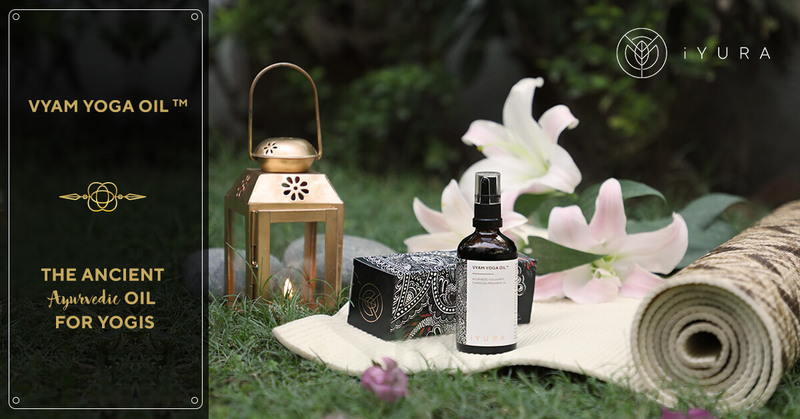 This warming oil will tone and energize you, but due to presence of the essential oils of Rosemary, Lavender and Citriodora (which is a lemon-scented eucalyptus that is often used to balance feelings of abandonment and mental agitation, poor concentration and confusion by aroma experts), Vyam Yoga Oil™ will also refresh and soothe you and get you in the right state of mind for a mind-body-soul balancing work-out! 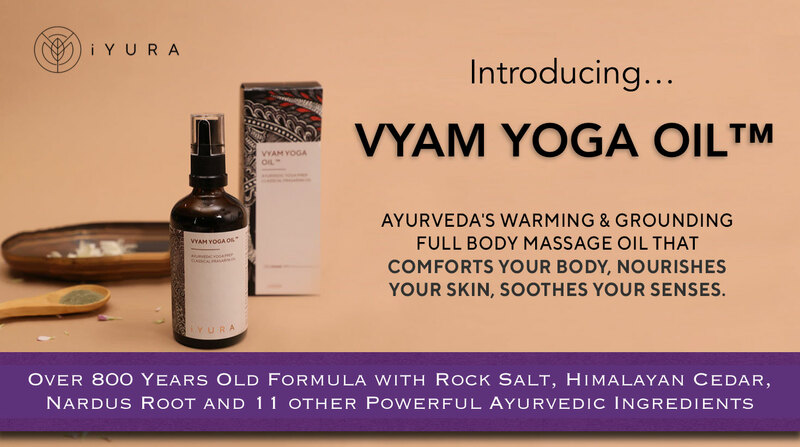 Get started with Vyam Yoga Oil™ here now & get a special 11% discount! How is iYURA's Vyam Yoga Oil Different Than All Other Oils? Not a self-concocted potion - has been in the ancient texts for over 800 years and has been actively used for just as long in India, the motherland of the Ayurvedic science. 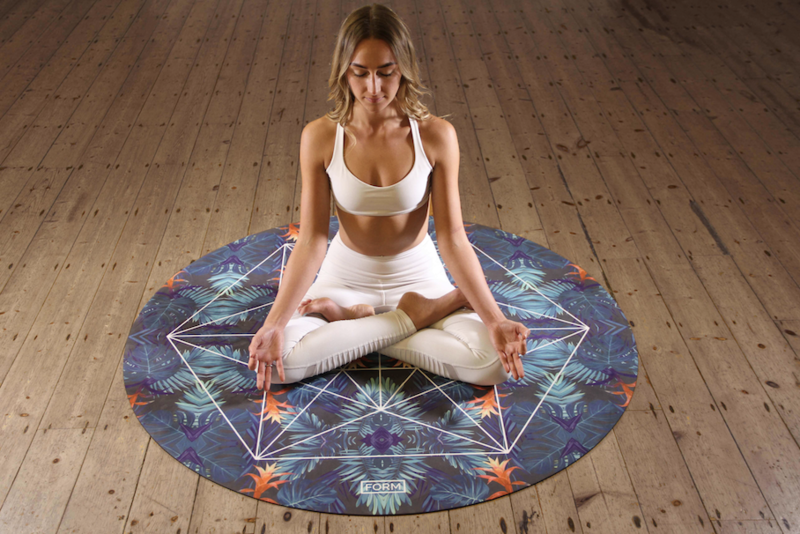 It has a blissful soothing yet awakening aroma that sets the tone just right for an enriching yoga or any fitness practice. The texture of this oil is very nourishing to the body and a regular massage with it has a rather grounding, balancing effect on body, mind, and soul. It is 100% natural and DOES NOT CONTAIN any mineral oil, silicone, additives, binders, chemicals or heavy metals. All iYURA oils and other products are vegetarian, fully natural and are NEVER tested on animals. Get yours with a special 11% off - that's a flat $5 discount - here now! Exercise is not just a necessity for keeping fit, it is also a great way to pay conscious attention to your body, your real home and show it love and care. When you engage with your body consciously and lovingly - massage also helps the cause through reassuring touch, the kind that brings comfort to a crying child. 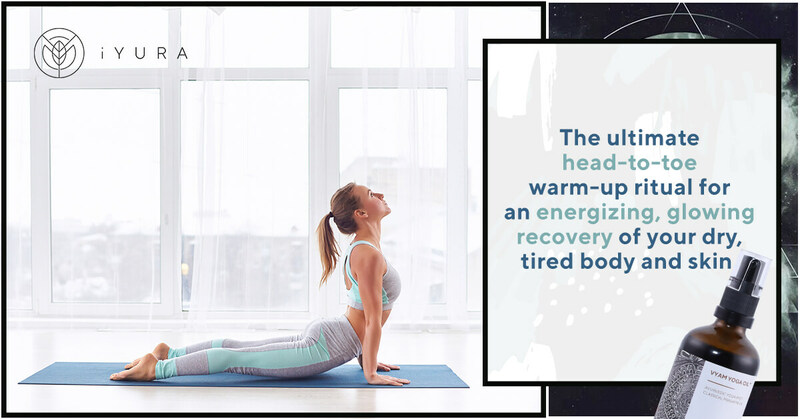 In the morning when you do it, you wake your body up, you don’t throw into a rapid hurricane of movement, you prepare it to support you in warming you up and getting ready for a more optimal, focused experience. Why not start the day focused, energized and tuned in with your mind, body, soul, head, limbs, and skin?! 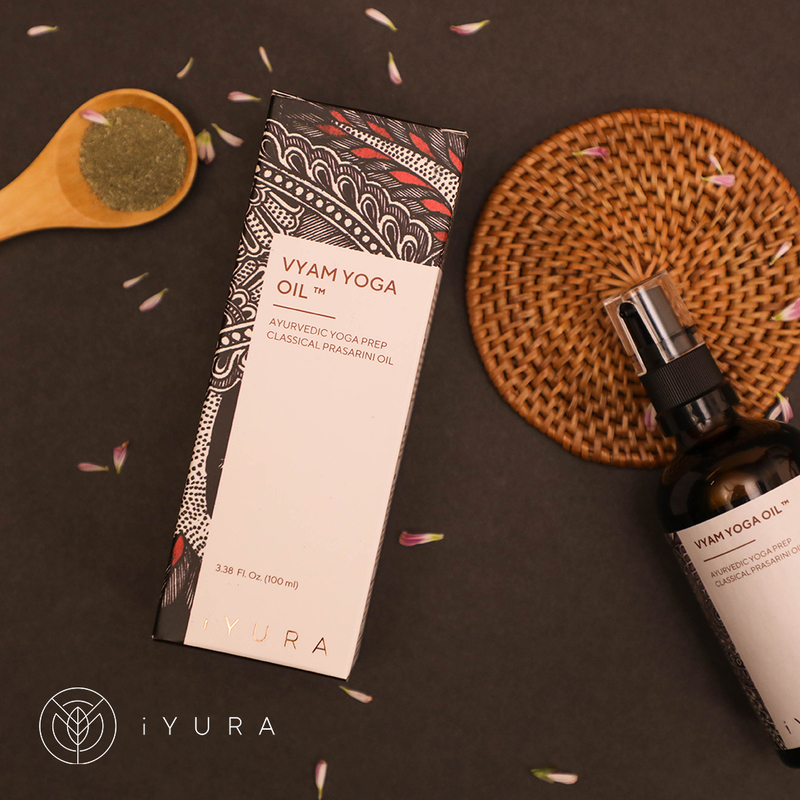 iYURA’s Vyam Yoga Oil™ is the perfect warming oil to prep and ground your body for focused ‘Vyayam’ or exercise. 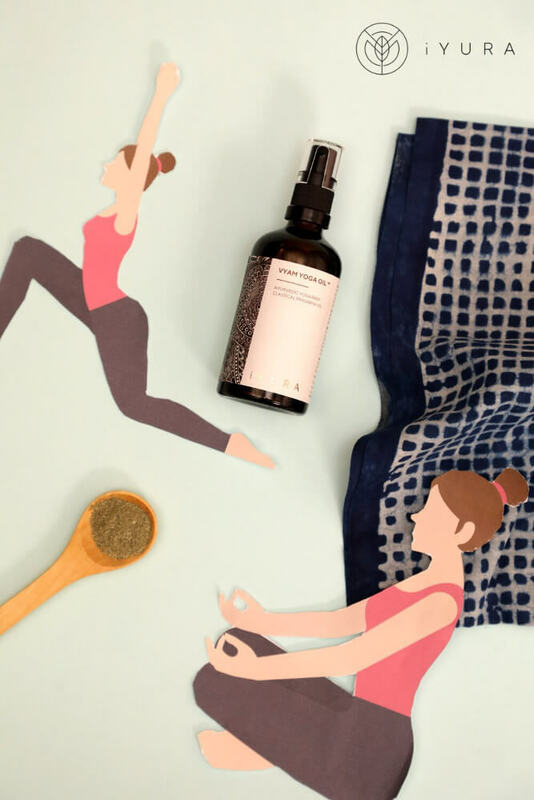 Meant to be used before your daily Yoga practice, this oil warms your body up, uplifts subtle energies and supports your strength for the perfect workout! This unique formulation contains powerful Ayurvedic herbs like Himalayan Cedar, Skunk Vine, Long Pepper, Indian Camphorweed and many more unique ingredients rarely found in oil formulations like curd and fermented rice gruel which also help the skin tone! There’s a new way to shrug off fatigue and tiredness BEFORE you even start your Yoga or exercise - it’s called, Vyam Yoga Oil™. SPECIAL DISCOUNT - GET 11% OFF! Introducing the 1st Ancient Yoga Oil brought to the USA! Great for Yogis, seniors, and anyone who would love an active lifestyle glowing with vitality! Now get $5 flat off - that's an 11% discount! Only available during the introductory period! iYURA’s Vyam Yoga Oil™ is a part of iYURA’s Classical Collection of products. Herbal products contain various potent herbs. Read through the list of ingredients to make sure you’re not allergic to any of them. Always do a patch test. If, under a rare circumstance, for any reason, you feel that you’d like to return a product, simply write back to us and we will ensure you’re refunded. For external use only. Test for allergy. Contains cow milk. Not tested on animals. Do not apply to wounds and rashes. This product is not meant to treat, mitigate, prevent, heal or cure any disease.